Baiyun Shan (White Cloud) Mountain is a popular tourist attraction just outside of Guangzhou, with the lofty heights providing phenomenal views of Pu Valley, the Nengren Temple, and the sprawling cityscape of Guangzhou. 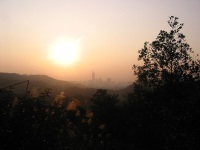 The mountain lies just north of Guangzhou and on a clear day visitors can see the whole city. There are cable cars running for just over a mile (1.7km) between Yuntai Garden and Peak Park, a fun and exhilarating way to see the area. The park consists of 30 peaks and covers over 17 square miles (28 sq km). It is a stunningly beautiful scenic area that includes well-maintained gardens, numerous temples, a Sculpture Park, a golf course, and what is said to be Asia's largest bird cage. However, the majority of time in the park is spent walking along the winding paths up in the clear mountain air and relishing a break from the city. Unfortunately though, as with most monitored nature areas in China, visitors are not really given the freedom to wander, hike, or picnic beyond the paths. It can also get very crowded, but with a little effort travellers can find the more peaceful areas. While there are a few stalls and vendors, visitors are advised to take their own drinks and snacks.